Boost any ensemble and let your sense of style shine bright with our 14k white gold 5mm slightly domed super light comfort fit ring. White gold is one of the most popular alternatives to platinum, and it offers an excellent value without compromising on quality and sophistication. White gold’s malleable qualities are excellent for resizing and refinishing depending on the wear and tear your ring experiences over time. Shopping for wedding rings on a strict budget? Our men’s 14k white gold 5mm slightly domed super light comfort fit ring is the perfect solution for the modern groom that wants to stick with a precious metal. Your wedding day may be about the bride, but you can certainly take her breath away by wearing our 14k white gold 5mm slightly domed super light comfort fit ring for your wedding. The polished finish offers a lustrous sheen to admire from every angle. Best of all, the comfort fit band means that you can wear your ring comfortably at home, at work, or anywhere the day leads. Comfort fit bands usually measure a half-size smaller than traditional wedding bands. We suggest that you have your ring finger sized by a professional at your local jewelry store to ensure the comfort fit style is right for you. 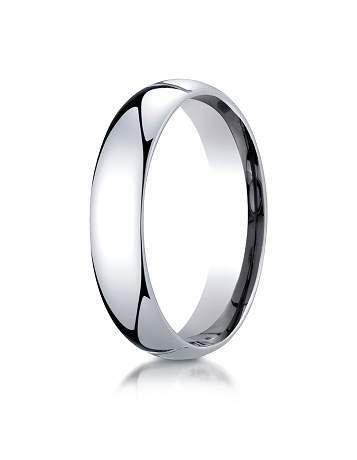 If you have any questions or concerns about our men’s 14k white gold 5mm slightly domed super light comfort fit ring, please feel free to contact the JustMensRings.com customer service team for further assistance.